Aromas are complex, slightly with black cherry, plum, light toast/wood notes, and a hint of spice. This wine has a lovely texture in the mouth, its light, elegant tannins setting the stage for a full-flavored wine with moderate acidity. Fruits are black (cherry and raspberry) with a supple mouthfeel. The wine is very harmonious in every dimension (aroma, texture, flavor, concentration) and will continue to develop with time. 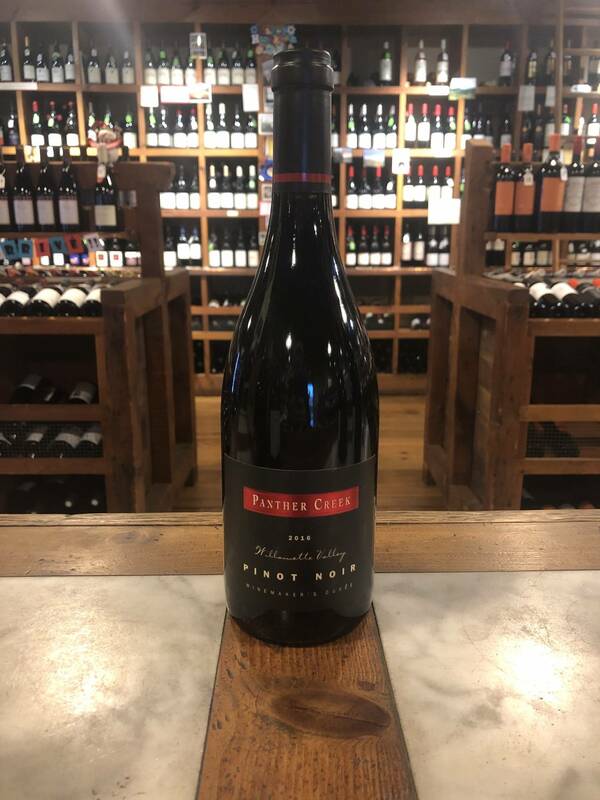 Panther Creek Cellars was founded in 1986 by Ken Wright, a master of Pinot Noir; the winery has also produced Chardonnay and Pinot Gris since its inception. Over the years, three other winemakers have taken the helm or played a major role as consultants. Bacchus Capital Management, a private equity firm specializing in the wine industry, acquired Panther Creek in 2013; Tony Rynders of Domaine Serene fame took over as head winemaker, a post he currently holds. Panther Creek sources its fruit from some 13 vineyards in five AVAs, working as partner or holding long-term contracts. Fruit for this wine comes from six vineyards on a variety of soils, with volcanic basalt and marine sediment dominant. Eola-Amity Hills, Dundee Hills, Yamhill-Carlton, and Chehalem Mountains AVAs are represented. Grapes were harvested manually and the wine was aged eight months in French oak, 15% new.